See the Council's statement on the House passage of H.R. 1. See the Council's joint advertisement with Independent Sector and the National Council of Nonprofits on H.R. 1 - November 15, 2017. On November 2, 2017, Republican leaders in the House—led by Speaker Paul Ryan (R-WI) and Ways and Means Committee Chairman Kevin Brady (R-TX)—introduced a bill to reform the United States tax code: the Tax Cuts and Jobs Act (H.R. 1). On November 9, the House Ways and Means Committee passed H.R. 1 on straigtht party-line vote of 24-16. The Committee Report of H.R. 1 is now available online. On November 16, H.R. 1 passed the House by a largely party-line vote of 227-205. The Council strongly opposed this bill, given that it does a number of things that would restrict and decrease the charitable giving that our communities rely on. Current Law: The charitable deduction is a provision which allows individuals to reduce up to 50% of their taxable income by the amount of the charitable contributions they make if they itemize their deductions. As a result, taxpayers generally are not subject to federal income taxes on money they give away to charities. Some limits apply depending on the type of gift (cash, stocks, and real property, for example) and the type of organization receiving the gift. Proposal: The charitable deduction would be maintained as it is written under current law. As a result of the changes proposed elsewhere in the bill, the scope and value of the charitable deduction would be significantly reduced. A study by Indiana University estimates that leaving the charitable deduction as it is, while increasing the standard deduction and consolidating/changing the marginal income tax brackets (both included in H.R. 1), would trigger a decrease in charitable giving by up to $13.1 billion over the course of one year. A repeal of the estate tax (included in H.R. 1) would further exacerbate this impact on charitable contributions, given that approximately 8% of all charitable giving comes from bequests (Giving USA, 2017). Additionally, the Joint Committee on Taxation (JCT) released an analysis on Nov. 7, 2017 of the impact of H.R. 1 on charitable deductions for fiscal year (FY) 2018. Under current law, JCT estimates that 40.7 million taxpayers will claim a total of $241.1 billion in charitable deductions in 2018. Under the Tax Cuts and Jobs Act, only 9.4 million taxpayers will claim a total of just $146.3 billion—a decrease of approximately 40%, or $95 billion. The Tax Policy Center released a study on Nov. 15, 2017, that estimates H.R. 1 would decrease charitable giving by $12.3 - $19.7 billion in 2018. Leaving the structure of the charitable deduction unchanged, while making changes to these aforementioned parts of the tax code, will have a significant negative impact on charitable giving. Current Law: A charitable contribution deduction is limited to a certain percentage of the individual’s adjusted gross income (AGI). The AGI limitation varies depending on the type of property contributed and the type of exempt organization receiving the property. In general, cash contributed to public charities, private operating foundations, and certain non-operating private foundations may be deducted up to 50% of the donor’s AGI. Contributions that do not qualify for the 50% limitation (e.g., contributions to private foundations) may be deducted up to the lesser of (1) 30% of AGI, or (2) the excess of the 50% -of-AGI limitation for the tax year over the amount of charitable contributions subject to the 30% limitation. Capital gain (i.e., appreciated) property contributed to public charities, private operating foundations, and certain non-operating private foundations may be deducted up to 30% of AGI. Capital gain property contributed to non-operating private foundations may be deducted up to the lesser of (1) 20% of AGI, or (2) the excess of the 30% -of-AGI limitation over the amount of property subject to the 30% limitation for contributions of capital gain property. Proposal: Increase the AGI limitation for charitable cash contributions from 50% to 60% with no changes proposed for non-cash gifts. Current Law: The total amount of itemized deductions (other than medical expenses, investment interest, and casualty, theft, or wagering losses) is limited for certain upper-income taxpayers (sometimes referred to as the “Pease limitation”). This limitation applies on top of any other limitations applicable to such deductions. Under the Pease limitation, the otherwise allowable total amount of itemized deductions is reduced by 3% of the amount by which the taxpayer’s adjusted gross income exceeds a threshold amount. For 2017, the threshold amount is (1) $261,500 for single individuals, (2) $313,800 for married couples filing joint returns and surviving spouses, (3) $287,650 for heads of households, and (4) $156,900 for married individuals filing a separate return. The Pease limitation does not reduce itemized deductions by more than 80%. Proposal: The Pease Limitation on itemized deductions would be repealed. This removes the cap to the total amount of itemized deductions that upper income taxpayers would be allowed to claim. Current Law: A donor/taxpayer must obtain a contemporaneous written acknowledgement (or a gift receipt) from the charity to which he/she donated $250 (or more) in order to substantiate that contribution for claiming the charitable deduction. As an alternative, the Code provides an option for the charity to file a document with the IRS containing detailed information about the gift and the donor in lieu of providing a gift receipt. Proposal: Elimination of the alternative gift substantiation, which—in certain cases allows—the donee organization to file a separate document with its annual IRS return rather than provide a contemporaneous gift receipt to donors for contributions exceeding $250. The "slippery slope" it poses to evolve from an optional method to a mandatory requirement. In response to the many concerns articulated in the comments received on this matter, the IRS withdrew the proposed rule in January 2016. Current Law: Income derived from a trade or business regularly carried on by an organization exempt from tax under Code section 501(a) (including pension plans) that is not substantially related to the performance of the organization’s tax-exempt functions is subject to the unrelated business income tax (“UBIT”). The highest corporate rate is applied to unrelated business income. A college or university that is an agency or instrumentality of a State government (or political subdivision) generally is subject to UBIT on any unrelated business taxable income. It is unclear, however, whether certain State and local entities (such as public pension plans) that are exempt under Code section 115(l) as government-sponsored entities as well as section 501(a) are subject to the UBIT rules. Proposal: All entities currently exempt from tax under section 501(a) of the Internal Revenue Code would be subject to UBIT rules. Current Law: Under current law, income derived from a research trade or business is exempt from UBIT in the following cases: (1) research performed for the United States (including Prepared by Ways and Means Committee Majority Tax Staff 74 agencies and instrumentalities) or any State (or political subdivision); (2) research performed by a college, university or hospital for any person; and (3) research performed by an organization operated primarily for the purposes of carrying on fundamental research the results of which are freely available to the general public. Proposal: Applies UBIT to income from fundamental research that is not made freely available to the public. Current Law: Under current law, tax-exempt entities are situated similarly to taxable entities with regard to providing their employees with transportation fringe benefits, and on-premises gyms and other athletic facilities, as such benefits pass from the employer to the employee free of tax at both levels. Employers subject to Federal income tax may deduct the costs of such benefits, with tax-exempt entities not needing to deduct the costs of such benefits, and their employees may exclude the values of such benefits from their taxable incomes. Proposal: Certain fringe benefits to employees such as transportation and on-premises gyms and athletic facilities would now be characterized as unrelated business taxable income and tax-exempt entities would be required to pay the tax on the value of those benefits equal to the corporate tax rate. NOTE: Further legal research is pending on this issue. We will provide an updated analysis as new information is available. Current Law: Under current law, the business deduction allowed to publicly traded C corporations for compensation paid with respect to chief executive officers and certain highly paid officers is limited to no more than $1 million per year. Similarly, current law limits the deductibility of certain severance-pay arrangements (“parachute payments”). No parallel limitation applies to tax-exempt organizations with respect to executive compensation and severance payments. Proposal: Tax-exempt organizations would be subject to a 20% excise tax on compensation in excess of $1 million paid to any of its five highest paid employees for the tax year. Compensation would include cash and the cash value of benefits other than payments of a tax-qualified retirement plan and amounts that are excludable from the executive’s gross income. Once an employee is determined to be one of the five highest compensated employees, the organization is responsible for paying the 20% excise tax on any compensation over $1 million. The excise tax would also apply to “excess parachute payments”—a payment contingent on the employee’s separation from the organization that equals or exceeds three-times the amount of that employee’s base compensation. Current Law: 501(c)(3) public charities are permitted to administer donor advised funds (DAFs)—to which donors may give charitable contributions and thereafter provide nonbinding advice or recommendations with regard to distributions from the fund and/or the investment of assets in the fund. Their (in)activity policies for DAFs. The aforementioned DAF reporting requirements come from a provision that has its roots in negotiations during the summer of 2015 to piece together what became known as the CHARITY Act. The reporting requirements were accepted by the charitable sector in exchange for an expansion of the IRA charitable rollover to allow for distributions to DAFs. This bill would require DAF sponsoring organizations to disclose information about the funds they manage without expanding the IRA charitable rollover as was originally intended. Current Law: Private foundations are subject to a 2% excise tax on their net investment incomes. However, they may reduce this excise tax rate to 1% by making distributions equal to the averages of their distributions from the previous five years plus 1%. Proposal: This bill would consolidate the rate at which private foundations are taxed on net investment income from the current two rates to a flat rate of 1.4%. According to estimates from JCT, this would generate $500 million in federal revenue over 10 years. Current Law: Private operating foundations are a form of private foundation that primarily fund their own programs and activities as opposed to making grants to other organizations. Private operating foundations are not subject to the same 5% payout rate as private non-operating foundations. Some art museums are classified as private operating foundations under the Internal Revenue Code. Proposal: In order for such art museums as described above to maintain their status as a private operating foundation (and as such, be exempt from the 5% payout rate that private non-operating foundations are subject to), they much be open for admission by the public for at least 1,000 hours per year. Current Law: 501(c)(3) charitable organizations are prohibited from participating in, or intervening in (including the publishing and distributing of statements), any political campaign on behalf of (or in opposition to) any candidate for public office. This prohibition is often referred to as the “Johnson Amendment”—named after then-Senator Lyndon B. Johnson, who introduced it in 1954. Proposal: Under Chairman Brady’s Nov. 9 amendment, all 501(c)(3) charitable organizations—not limited to “churches”—would be permitted to engage in political intervention occurring in the “ordinary course of the organization’s regular and customary activities” and incurring “not more than a de minimus incremental” cost. The provision would sunset after five years, ending after Dec. 31, 2023. 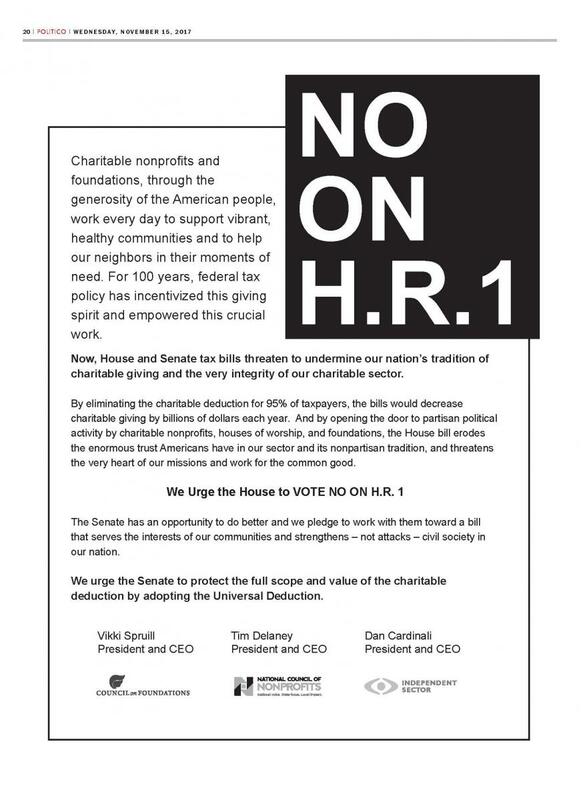 The original version of this bill proposed that charitable organizations defined under 508(c)(1)(A)—which includes “churches, their integrated auxiliaries, and conventions or associations of churches”—would be permitted engage in political intervention occurring in the “ordinary course of the organization’s regular and customary activities” and incurring “not more than a de minimus incremental” cost. The Council interprets this to apply broadly to all religious institutions, as recognized by Congress and the IRS. The proposal did not include a sunset for the provision. Even if only a small handful of groups accept contributions they receive for their missions and redirect those funds to be used for a politically-motivated purpose (i.e. financial or messaging support for a political campaign), other donors to that group will be reluctant to give for fear that their donations will likewise be misused. Dollars diverted to Republican-/Democrat- affiliated churches are dollars denied to charities struggling to fund programs and initiatives that build and strengthen the communities that they serve. The decision in the Citizens United v. Federal Election Commission case (often referred to as Citizens United) deemed political spending as a form of protected speech under the First Amendment. Weakening the Johnson Amendment could pave the way for additional money to flow from charitable organizations into electoral activity. According to estimates from JCT, this proposal would cost the federal government $2.1 billion over 10 years. This estimate reflects the federal tax revenue that will be lost when contributions—that previously would have been given to electoral and political organizations (which are not deductible in the same way that charitable contributions are—are now given as tax-deductible, charitable gifts. That translates to approximately $8 billion given to "churches" for political activity. The 5-year sunset included in Chairman Brady’s Nov. 9 amendment (which expanded the provision to apply to all 501(c)(3) organizations, not just “churches”) was inserted in order to contain the cost of this provision. Current Law: Under current law, a private foundation may not own more than a 20-percent interest in a for-profit business, and any private foundation that does hold an interest in excess of 20% is subject to a 10-percent excise tax based on the value of that excess holding unless the private foundation divests itself of the excess holdings within 5 years of the date of receipt. Any private foundation that does not divest itself of such excess holding in a timely manner may be subject to an additional 200-percent excise tax based on the value of that excess holding. The excess business holding rule also applies to donor advised funds held by public charities. Operates independently from the business enterprise. Current Law: Private foundations are subject to an excise tax on their net investment income (see “Simplification of Private Foundation Excise Tax”). This excise tax does not apply to the investment income of public charities—which includes colleges and universities. Proposal: The original version of this bill proposed that private colleges and universities with at least 500 students and total assets of at least $50,000,000 (excluding those assets which are used directly for carrying out the institution’s educational purpose) would be subject to a 1.4% excise tax on net investment income. State colleges and universities would be exempt from this requirement. Calculating the total amount of net investment income that would be subject to the 1.4% excise tax. This would include income generated by supporting organizations, such as university foundations.